Poppies and Paperbacks: Happy Autumn, Everybody! I love the fall. It’s my favorite season right next to summer, and it’s so convenient that they back up to one another. I think that specific season change is the most exhilarating and more importantly the most enchanting. The leaves changing, time to pull out sweaters, start fires and wear boots. The sun gets lower in the sky, the trees dance more in the crisp breeze and the black cats seem more romantic than usual. And the colors! Oh the colors, so vibrant, so magical. I ran across this recipe recently. As you know I love to adapt the recipes I find because stealing stinks and I want to make them my own. The adaptation is after the original recipe. 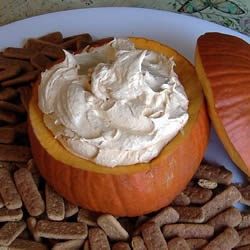 All Recipes calls it Pumpkin Fluff Dip. Cover dip with cellophane and store with pumpkin top on in fridge until lready to serve. *Adaptation: Change the cool whip to fat free cool whip and change pudding to fat free, sugar free vanilla pudding. You save about 100 calories per serving.